Deers Ears are a member of the Gentian Family. 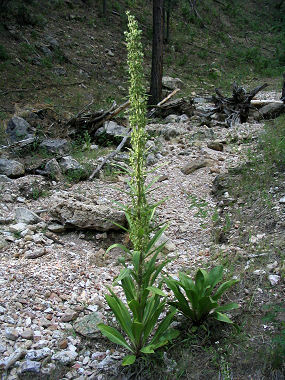 The plant grows to 6 feet in height and has light green, lance shaped leaves that grow in whorls along the plant's stem to 12 inches in length at the base, becoming smaller further up the stem. The plant typically grows in open pine forests and aspen-conifer forests at elevations between 5000 - 10000 feet. 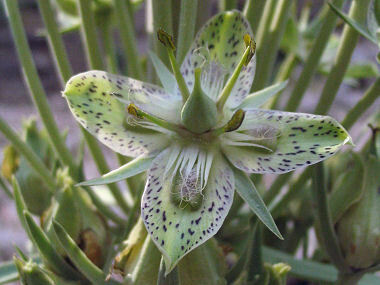 Deers Ears are also known as Swertia, Green Gentian, Elkweed and Monument Plant. Deers Ears bloom between May - August and produces greenish-white flower with purple spots with four petals to 1.5 inches in width in an elongated cluster at the top of the plant.